Thanks for the incredibly insightful review. As a huge fan of Fagen’s solo work as well as Steely Dan, The Nightfly and Kamakiriad are on my short list of true favorites. Morph the Cat has grown on me and I really like a few of its tracks. I’ve only listened to Sunken Condos twice so far, and not yet with complete attention. Now I’m definitely looking forward to spending the time it takes to allow it to join the canon of Fagen tunes already permanently downloaded into my brain. No, thank you for taking the time to read and comment. It really means a lot. I was really surprised by how good this album was, so I’m eager to hear more of Fagen’s solo stuff. What album should I start with? Also, what’s up with Walter Becker having like 2 albums? Seems like he should have been just as voluminous in his output as Fagen. Lastly, have you see the Yatch Rock TV show? Someone directed me to it on FB and they’re pretty great (episode 10 features Steely Dan). I LOVE Yacht Rock. Eagles v. The Dan, lol. Hilarious. Re: Fagen’s solo stuff, I’d say start at the beginning with The Nightfly (1982), then follow it up with Kamakiriad (1993). It feels important to me to not only absorb the different approach and vibe he takes on each album, but to take the time journey on a couple of levels – Nightfly is an homage to the past and Kamakiriad was meant to take place slightly in the (then) future around the year 2000. Morph the Cat (2006), is the end of the trilogy – I’m not sure of the time frame in which it is supposed to take place – I guess it is (was) the present. Also, the three, in another way, deal with the stages of life – Nightfly has a youthful optimism and Morph definitely has some dealings with endings and death. On it’s own, I wouldn’t think of Kamakiriad as being a swimming-through-the-middle-of-life album, but looked at in context, it would make sense to view it that way. But first and foremost, just enjoy the music! I agree with what you say about duos – when you take them apart, what each produce can be pretty disparate. I love Steely Dan so much that I hate to dis either of them, but I have to admit that I’m not a big fan of Becker’s solo work. I don’t own any of his solo CDs, so also have to say I haven’t listened extensively. For me, I’m not a huge fan of his voice (I’m in LOVE with Fagen’s voice.). The songs are okay, but don’t stand out for me, particularly. But as I say, since I haven’t focused on them, there could be standout exceptions. I do think Becker is a brilliant player and in the live show SD, he’s the one with the humor and personality. I’d be curious to see what you discover delving into WB’s tunes. So I have been listening a lot to Sunken Condos (such a weird title and image, after the hurricane). I am loving it. It’s the only thing that has been breaking my recent re-obsession with Adam & the Ants. I really like “Weather in my Head” also. It is very accessible, which is nice once in a while. 🙂 I also agree with the problematic nature of “Out of the Ghetto.” I actually dig the groove a lot, then always somewhere in the middle of it I think, “WTF? Really, Donald? !” I can see how he sings a lot about gritty, city culture and felt he had a “pass” to have the character in the song use that kind of approach. Ultimately, I think not so much. With all the weirdness DF and SD have sung about over the years, it may be the first tune that gives me pause in quite this way, And yes, better it doesn’t fall upon ill-informed ears. Ok, well this was a long comment! Should’ve written my own damn blog, which has been sorely neglected (for at least some good reasons, so I won’t stress too much… but I will get back to it). I just started listening to The Nightfly, and I’m digging it! 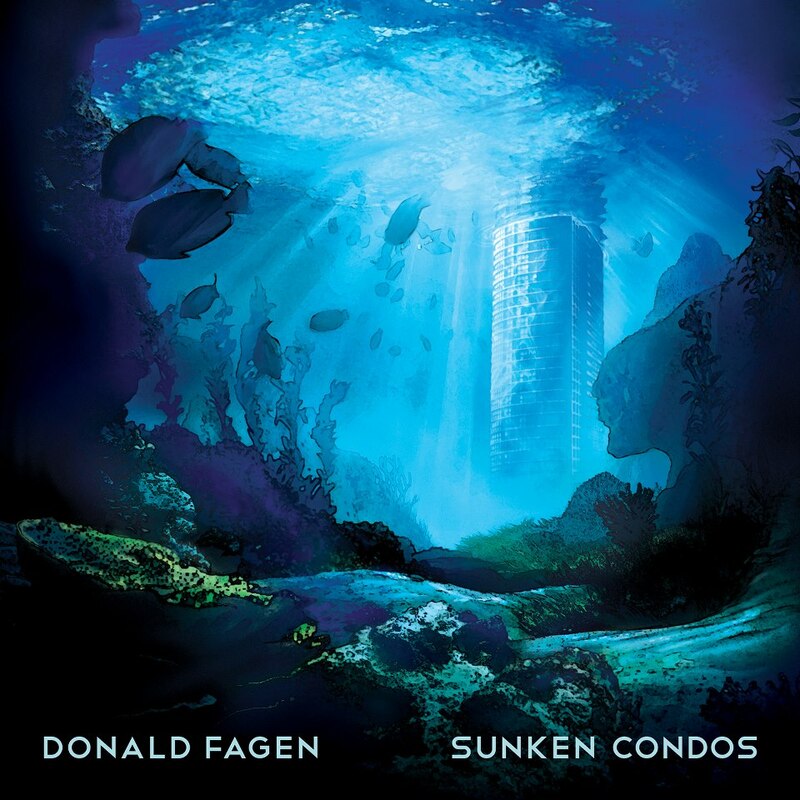 Sunken Condos is really strange for me as I only recently escaped New York following Hurricane Sandy. The title/artwork coupled with “Weather In My Head” are a bit of theme, as is the idea of being “under water” in one’s property investment (which I also know a little about, sadly). I don’t feel bad for Becker, because he’s a great talent even if he needs a Donald Fagen. There’s no shame in being a better collaborator than solo artist. I will agree with you that Fagen’s voice is infinitely better. I don’t mind the long comments, so long as you get back to writing on your own website. And hey, there’s no rule that says you can’t review this album yourself.